July 4th 2012 … HAPPY INDEPENDENCE DAY!!! Happy Birthday America, to the greatest nation on Earth, the Home of the Free and the Land of the Brave. Please remember on this day that it is each generations responsibility to maintain the freedoms and liberties that our Founding Fathers bestowed on us and with their sacrifices and so many others along the way. 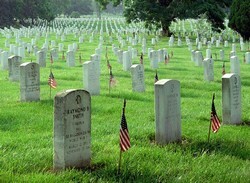 Remember America, freedom is not free. As you celebrate this 4th of July with family and friends remember also that it is not government, but your Creator that you are endowed with certain unalienable Rights. In a time in which it would appear that more and more Americans accept being dependent upon their government, maybe it is a good time for “We the People” to really understand and realize what others died for our rights to be free. A note to the present day politicians whether they be Democrats, Republicans or Independents … Today “INDEPENDENCE” is to be celebrated, not dependence. The United States of America was founded on liberties and freedoms endowed from their Creator, not by government laws made to silence, enslave and make “WE THE PEOPLE” dependent on others. The USA is a sovereign country with a border and governed by the rule of law. It is a government of, by and for the people. Not of and by politicians and those that would destroy this great nation. It is our duty to make the government responsible to the people!!! USA Fans Sing National Anthem at KC Live! 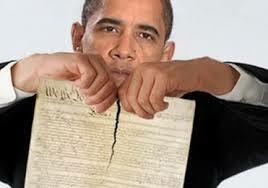 IT WAS INEVITABLE … OBAMA IS COMING AFTER YOUR GUNS. Lame duck Barack Obama is looking to once again fundamentally transform America and directly attack the Second Amendment. CNN is to host a town hall meeting at George Mason University in Fairfax, Virginia where Obama will look to push gun control even though the Second Amendment of the U.S. Constitution states that Americans have the right to bear arms. Sorry, but I don’t trust a word this man says. So he wants to get rid of the guns that protect Americans, really? So then why are the guns not taken away that protect politicians? If Americans allow this to stand, it is the death of liberty. Please do not let this man destroy this country any more than he already has. President Barack Obama is mounting a final-year push to make gun control part of his legacy despite Republican opposition and is expected to announce unilateral action soon. He will join CNN’s Anderson Cooper Thursday for an exclusive one-hour live town hall on gun control at George Mason University in Fairfax, Virginia, in hopes of mounting a final pitch to the public. It’s an issue he has had zero success on so far in his presidency, despite his repeated, emotional appeals for change. Congress has remained a roadblock even in the face of widespread public support for Obama’s past calls for universal background checks or bolstered mental health support, with near uniform opposition from Republicans and a split on the issue among Democrats. Obama will sit down with Cooper at 8 p.m. ET for the event, titled “Guns in America.” The event’s timing coincides with the fifth anniversary, next Friday, of the shooting of former Rep. Gabrielle Giffords, D-Arizona, in a rampage that left six dead and 13 others wounded. On January 4, President Obama will meet with Attorney General Loretta Lynch to finalize the executive gun controls expected to be announced next week. A few months ago, I directed my team at the White House to look into any new actions I can take to help reduce gun violence. And on Monday, I’ll meet with our Attorney General, Loretta Lynch, to discuss our options. Because I get too many letters from parents, and teachers, and kids, to sit around and do nothing. I get letters from responsible gun owners who grieve with us every time these tragedies happen; who share my belief that the Second Amendment guarantees a right to bear arms; and who share my belief we can protect that right while keeping an irresponsible, dangerous few from inflicting harm on a massive scale. UPDATE I: Donald Trump says I will veto Obama actions on guns. Republican presidential front-runner Donald Trump told supporters Saturday that he will veto President Obama’s actions on guns if elected to the White House. “The Second Amendment, it’s so great to me,” Trump said at a campaign rally in Biloxi, Miss. Trump said to loud cheers that there is an “assault” on the Second Amendment as Obama considers executive action on gun control. “I will veto that. I will unsign that so fast,” Trump said. JUST CURIOUS, HOW DO YOU THINK THE MSM WOULD REACT IF DONALD TRUMP OR ANY REPUBLICAN MADE SUCH A COMMENT? Isn’t it the unhinged, lunatic LEFT that is against guns and gun violence? Hmm, then why would Loring Wirbel, board member of the American Civil Liberties Union’s Colorado chapter and co-chair of the ACLU’s Colorado Springs chapter, call for supporters of GOP presidential hopeful Donald Trump to be shot before they vote for the billionaire businessman? Where is the liberal tolerance? Where’s the love? Better than that, this moron calls Trump a hate speech felon and yet is calling for people to shoot people in the process, seriously? Who’s the felon? Isn’t the liberal left double standard of intolerance remarkable? These are the folks that rail about free speech, yet they look to prevent Donald Trump from having his. Then this is the same bunch that look to take the guns away from law abiding citizens while they make threats of gun violence and call for voters to be shot. Unreal and SICK! 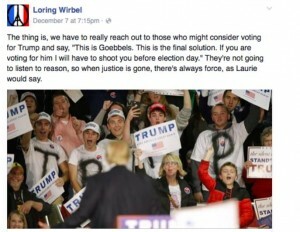 Loring Wirbel, board member of the American Civil Liberties Union’s Colorado chapter and co-chair of the ACLU’s Colorado Springs chapter, called for supporters of GOP presidential hopeful Donald Trump to be shot before they vote for the billionaire businessman. The thing is, we have to really reach out to those who might consider voting for Trump and say, “This is Goebbels. This is the final solution. If you are voting for him I will have to shoot you before election day.” They’re not going to listen to reason, so when justice is gone, there’s always force, as Laurie would say. More insane rants from the LEFT via Twitchy. Just curious, how is one allowed to make such a threat like this and a call for violence? Sorry, this goes beyond free speech. It would appear The Donald has tapped into what Americans have been feeling for quite some time; however, our GOP politicians have been too gutless to discuss. Donald Trump spoke Saturday, July 11th at the annual FreedomFest Conference in Las Vegas. The Donald and a cast of many speakers, including Glenn Beck, Deneen Borelli, Dinesh D’Souza, Steve Forbes, US Sen. Mike Lee, US Sen. Marco Rubio and Stephen Moore assembled in Las Vegas to discover the new American dream at the FreedomFest Conference.